Will Grier is an American football player who plays for the West Virginia Mountaineers. He plays as a quarterback. He wears shirt number 7. He was given the name, 'Mr. Football USA'. Previously, he played for Florida Gators. He was also named Parade All-American Player of the Year. Rivals.com rated him as a four-star recruit and the second-best dual-threat quarterback in his class and 46th in overall. He has been given a name, Mr. Football USA. Will Grier was born on 3 April 1995. He was born to Chad Grier and Elizabeth Grier-Floyd in Davidson, North Carolina in the United States. He holds American nationality. He has 3 younger siblings. He has two brothers Nash and Hayes, and a sister Skylynn. He belongs to white ethnicity. He follows Christianity. His zodiac sign is Aries. He attended Davidson Day School in North Carolina. His amazing performance at high school earned him scholarship offers from several universities. He enrolled at the University of Florida. He then attended West Virginia University. Despite the scholarship offers from Auburn, Arkansas, North Carolina, Tennessee, and Wake Forest, he chose the University of Florida. He rushed 24-of-29 for 271 yards and four passing touchdowns against the Ole Miss Rebels, which became the best performance of his youth career. He was suspended for a year in 2015 after he tested positive for performance-enhancing drugs. He then transferred to West Virginia University in April 2016 but sat out of the 2016 season as per NCAA transfer rules. He played at the 2017 season but was ruled out for the rest of the season due to surgery of the finger broken in the game against Texas. At the end of the season, he was awarded ss Big 12 Offensive Newcomer of the Year. He was announced Preseason Offensive Player of the Year and earned the Preseason First-Team All-Conference place at the 2018 Big 12 Media Days conference. Although he was invited to the Camping World Bowl, he chose not to play in the bowl game, as he was preparing for the 2019 NFL Draft. Will Grier is married to Jeanne O'Neil Grier. The got married in 2016. The couple is blessed with a daughter, Eloise Marie Grier, born in 2016. Previously, he was romantically linked with Taylor Walker. Will Grier stands at a height of 1.91 m i.e. 6 feet and 3 inches tall. He has a body weight of 217 lbs i.e. 98 kg. He has an athletic body build. He has dark brown eyes and his hair color is black. As of 2018, his net worth is estimated at around $3 million. He is preparing for the 2019 NFL Draft. He is yet to shine and earn a fortune in the coming years. He owns a Cadillac. His father is a football coach and was a former quarterback for the East Carolina Pirates. All of his siblings are popular internet personality. As a junior, he threw for a national record of 837 yards in a game. 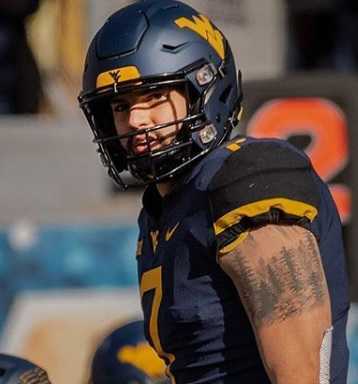 He did not list in the 2018 NFL Draft but chose to return to his senior season at West Virginia. He was listed on preseason watch lists for Maxwell Award, Walter Camp Award, and Davey O'Brien Award.